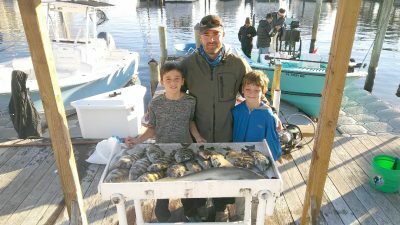 Last year’s warm weather didn’t have the sheepshead spawning strong until March. My good friends Bennie and Sandy Overstreet, owners of Gopher Plantation in Millwood, Ga. (a hunting and fishing lodge), come down every winter to catch this excellent table fare. Last year, they had to come down twice because the bite was not so hot in January. March was an entirely different story, with daily limits of the “convict fish.” This year the “sheepies” have already shown up strong, and signs of spawning have already occurred. Sheepshead can be caught in numerous locations: Mangroves, bridges, rock piles, artificial and natural reefs, pretty much any structure, but my favorite place is what I call the “sheepshead hole.” Located about one-half mile off the shipping channel on the Saint Petersburg side is an old rubble dump ground. It ranges around 9 to 13 feet deep. When the water is clear you can see all the rock and rubble. This area is a major spawning location for sheepshead. One hundred-fish days are not uncommon once the spawning season kicks off. 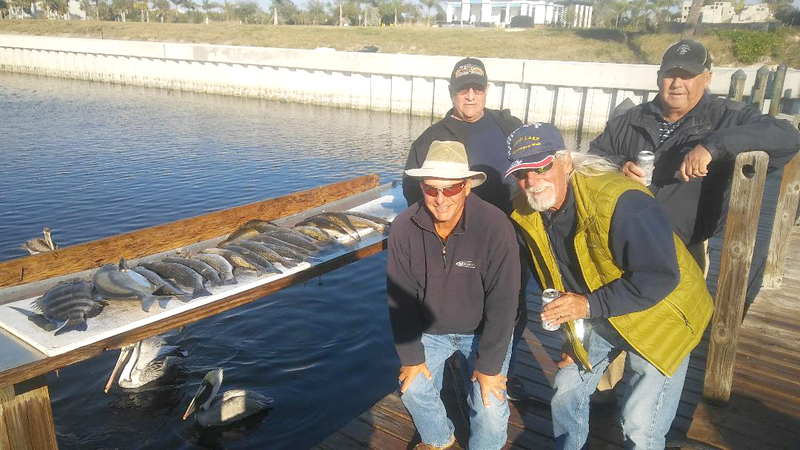 The “Sun City Center Crew” Skip, Ken, Mark and Danny with trout, pompano and sheepshead — ready for a fish fry. Last week we had two children on our charter who did a great job of hooking and landing these hard-fighting fish. In addition to the sheepshead, they also caught some grouper, grunts, mangrove snapper and sharks — all in the same spot. The day before, they caught around 30 redfish, trout and snook among the mangroves. Both of these young men caught their first inshore slam (snook, trout and redfish). Optimus Fishing Charters took first place in the Bait and Tackle of Apollo Beach All Species Tournament. Captains Mark (Chef Woz) Wozniak, Brian Lemelin and Joseph Brandenburg. There are many ways to catch sheepshead. At my favorite spot I simply use a jig head with shrimp. The size of the jig head is dependent on the tide (current). You need to get the bait down to the bottom, among the rocks. The key is feeling the nibble and setting the hook. It’s one of the few species of fish that I tell our clients it’s okay to set the hook with braided line. Sheepshead are notorious bait stealers, but once you get used to the technique of hooking them, it becomes fairly easy. When fishing this area, bring plenty of leader line and jig heads. It’s inevitable that you’ll get snagged in the rocks and end up with some break offs. Winter trout season is in full swing. Trout are abundant and eager to bite both live and artificial baits. On most days we can limit-out in just a short period of time. Often times we’ll catch bonus fish in the same locations. 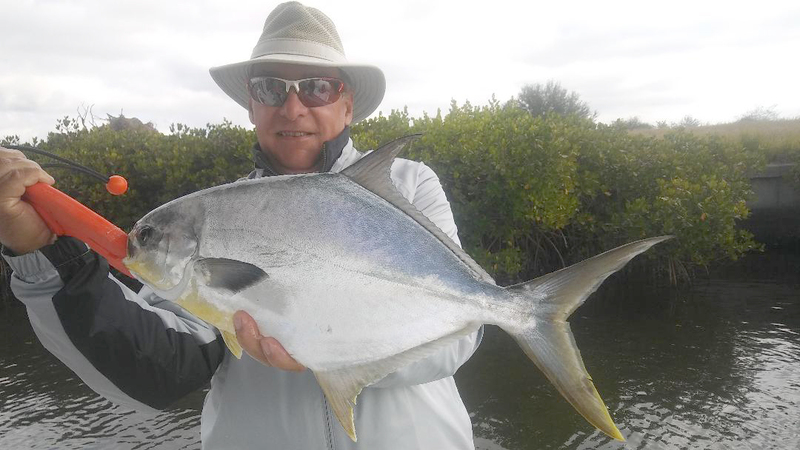 The “Sun City Center Crew” had a spectacular day catching trout and bonused with a big pompano and sheepshead. A 50-plus-fish day, they kept enough for their fish fry and released the rest. 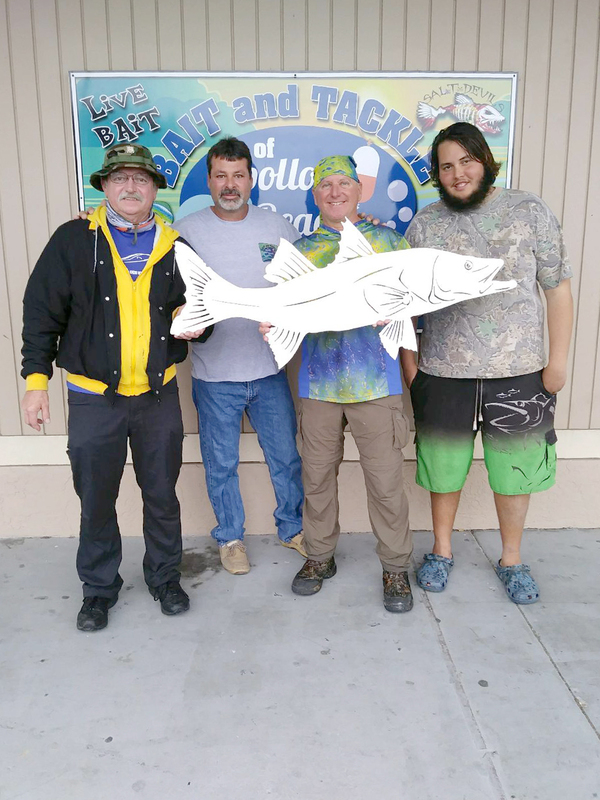 Optimus Fishing Charters notched another first place victory in the first Bait and Tackle of Apollo Beach All Species Tournament. 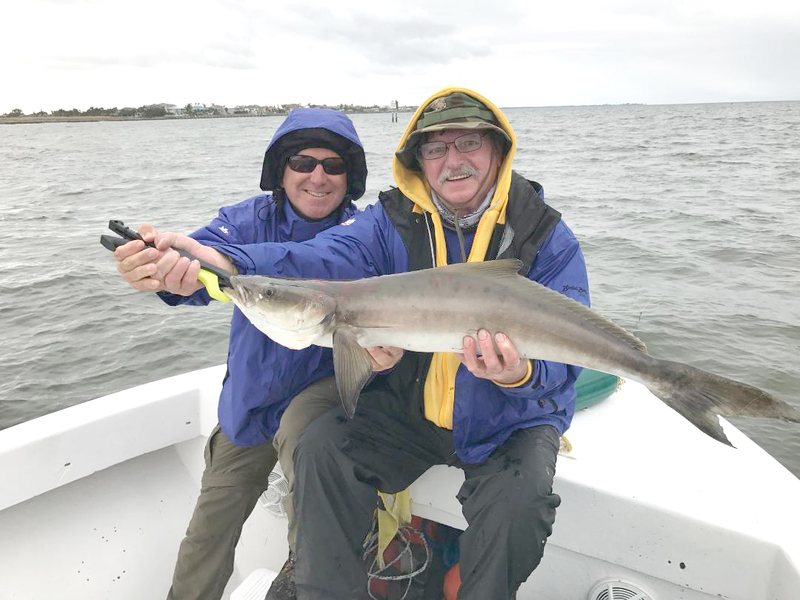 In addition to catching 12 different species, team member Chef Woz, caught his first keeper cobia. The weather wasn’t the best, but everyone involved had a great time. Many thanks to J.C. and his team at Bait and Tackle of Apollo Beach. As always, support your local businesses, that help us stay on the water. If you’re looking for a great day on the water, give me a call. I’d be happy to show you how much fun our fishery can be. Hope to see you on the water. Tight lines. The sheepshead bite has started. “Sun City Center Crew” member with the catch of the day. Chef Woz with his first Cobia.